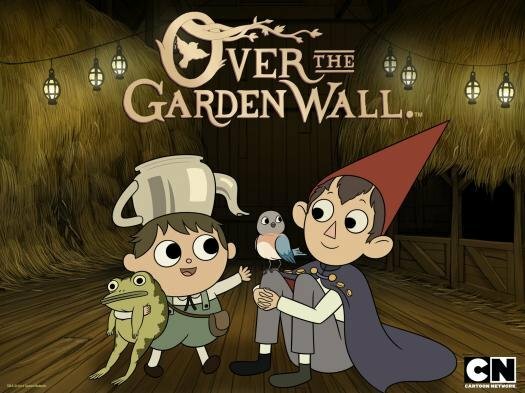 Today I discovered an animated TV show on Netflix called ‘Over The Garden Wall’. I loved it and found a lot to analyse so I had to write something about it. The premise of this Cartoon Network animation is pretty simple: two boys are lost in the woods. On their travels they encounter the strange and supernatural. Their world is influenced by classic fairytales and silent films from the 1920s. The latter, in a visual and design sense only. Perhaps there is also a dash of Shakespearean tragedy in there as the characters deliver melancholic monologues. Yes, all of this is in an animated comedy. The music and visuals are beautiful. It has that Cartoon Network magic where characters that look very stylised and unrealistic somehow come to life. Maybe it is the use of sound effects and their selection of talented voice actors. This show borrows a lot from the playbook of Studio Ghibli. This is to say that the surreal and bizarre are brought to life and the characters have very expressive faces. Despite the exaggerated nature of the people, we still see the most human aspects and connect to them. This is The Uncanny Valley Effect. One of the best things about ‘Over The Garden Wall’ is its writing. The comedy is clever and mature, in the first episode, they subvert the rules of fairytales. Rather than the trail of sweets rescuing the children, it leads the monster to them. This show is hilarious and clever, it can be enjoyed by people of all ages.